Browse through a large number of Haunted Houses and other Haunted Places in Illinois. Each year we bring you the scariest places in Illinois and this year is no different. So get out and find a Haunted Place or some other Haunted House in Illinois and get your scare on! Illinois has some of the best reviewed haunted houses. Smell of rotting flesh from Aurora at the Basement of The Dead & Shattered Haunted House. Haunted Houses near Chicago include Legendary Dungeon of Doom Haunted House, Rob Zombie's Great American Nightmare, The Massacre Haunted House, and Statesville Haunted Prison. Illinois haunted houses are scattered and well worth the journey. Abandoned Haunted House Complex has evil lurking around every corner in Sturtevant. Haunted Mansion and Asylum 13 of Bolingbrook, Illinois located inside the Sports Dome. Asylum 13 contains a portal which failed in attempting to restrain the most evil souls, in the 13 rooms, and the13 histories, associated with the most demented, indescribably horrific monsters of the past. Release of the insane is imminent and the danger is real. You are never alone in the Haunted Mansion and Asylum 13. Ghostly occurrences happen all the time here. This mansion of horror will have you question whether your eyes are playing tricks on your or if there is a real spirit wandering about. We will bring your fears to life. An encounter with your worst fear can come to life and scare you to death. Our residents of the Haunted Mansion and Asylum 13 are forever stuck in purgatory and thrive on the fears and screams of all who enter. The question is, will you be able to find the exit or be lost forever within the confines. Statesville Haunted Prison in Lockport, Illinois is home to the most notorious, evil, sick and twisted criminals of all time. This Maximum security prison has been breached! The prisoners have escaped and taken over. The warden has joined forces to take you on a tour to your wildest and sickest fears. Statesville Haunted Prison is an extremely disturbing, claustrophobic, permanent home to the aggressive mutants that dwell within the confines of the prison walls. Come visit the prisoners and encounter the evil of darkness and the horror of daily life inside the minds of these freaks. Permanently damaged by experimentation, they are looking for new flesh, the 100 or more criminals and vast travels through their cells will have you scared for your own life. If you make it out, you have to navigate through the City of the Dead. Descend into the caves and mines where the bodies of those lucky to die are buried. Or maybe unlucky? Those below are now following the gatekeeper from this unholy tomb of terror. Zombies are now thirsting for the warm blood and flesh of the living, for it calls to them, tempts them, calls to them. Will you make it to the surface before they capture you below? You may just take up a new residence in the threshold of the underworld. Basement of the Dead - draws you with utter curiosity, to take steps and descend into the portals of evil in Aurora, Illinois. Come for a walk into the basement of the damned, the terror of the unspeakable can be found down below. An explosion maimed and scalded a father who was the maintenance engineers and his son. Al and Imus were angered by the irresponsibility in replacing the defective and old heating system. After this tragedy, they never returned to work again, but the stories of those who have descended the stairway to the basement below, brings back a legend of the two revengeful angry souls who now reside in this unholy Basement of the Dead. Legends have been told by the ones who returned; for many victims have mysteriously disappeared into its depths. Only body pieces have turned up in drainage pipes near the rivers. Unspeakable horror, gore, and body mutilations are waiting for you to verify the existence of this terrible place. You will never descend steps to any basement the same after the viewing in the Basement of the Dead. The MASSACRE Haunted House welcomes you into one of the top ten haunted attractions in the Midwest. Located in Napierville, Illinois, you need to work up the courage of your every last nerve to the most intense, high scare events of the season. The Massacre Haunted House offers 15,000 square feet of disturbing terror around every corner. The Massacre Haunted House has the most amazing multi-room labyrinth of intense horror. This extreme haunted house has some of the most eerie encounters, frightening mazes, and state-of-art animatronics, and scenes that will blow your mind. The all new Fear Factory 3D is a definite must see! Fear Factory 3D technology is indescribably awesome; you will experience 3D like never before. From every angle, your mind will question what you see as disturbingly real or hauntingly bizarre. If thrill and chills are what you are searching for euphoria is closer that you think. Asylum Xperiment Haunted House Chicago is located inside the Odeum Sports & Expo Center in Villa Park, Illinois. This is the best haunted house in the Chicago area. From the creators of Asylum Xperiment Haunted House comes the master of illusion, theater, and special effects mixed with the most creative mind game playing on all of your fears and phobias. We challenge your most intense fears and leave wondering what you were thinking. The Asylum Xperiment Haunted House Chicago will get your adrenaline shot into overdrive! Still have courage left? Blackout will challenge the most seasoned thrill-seeker. This black maze of twists and turns is cleverly designed and full of surprises. Are you going the right way, with your heart pounding, trying to catch your breath, reflexes in overdrive, scenes to be savored and not rushed, escape is your only reprieve. This is not your typical crank-through haunted house.....this is the best haunted house in Chicago and an encounter you will never forget! On the grittier end of town…where the sidewalks are abandoned and the area gets just a little creepier , only the brave will search out… The Massacre. The car ride up, quickly questions your sanity – the slight possibility of what may very well be a well played out horror movie scene – until in the distance, you finally see lights – and a brightly lit mall suddenly comes into focus. Reading the neon words Massacre makes your stomach tingle… giddy with scary anticipation. You have heard stories of the evil, vile creatures known to frequent there – knowing exactly what you’re getting into….these creatures don’t play around. Gritty, creepy…more than your average scary clowns – the creatures who reside within The Massacre are an array of some of the most surreal – and beautiful – demons around. A little seedier as you enter in, your spidey senses alarming – knowing something’s off. It’s at that moment you realize this is going to be a great scare – taking it all in. Feasting your eyes upon extrodanarily ornamented actors who work the barrage of customers, you watch the eerily amusing spectacle put on in front of all who dare to venture in. With some of the most uniquely designed costumes around, the actors at The Massacre are not only spot on with not only the scares - but bring a touch of beautiful madness to this haunted attraction – making it a quite lovely experience for the eyes as well. Actors who are so creepy, original, and very comfortable in their own horrendous skin – the crew here at Massacre know how to really push your limits, invade your closest boundaries – and give their visitors a one of a kind, terrifying, gritty experience – bringing customers back for more – along with their friends. 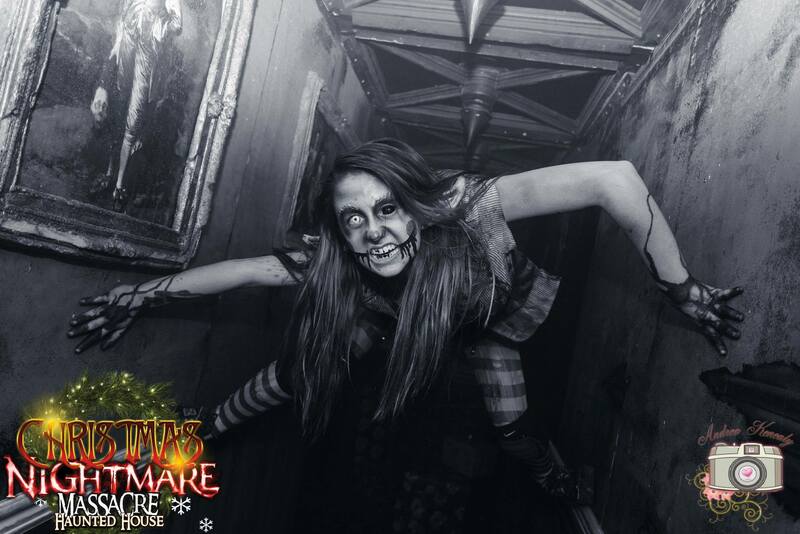 Voted #1 in the Chicagoland area last year – and scoring many awards prior – The Massacre Haunted House knows how to bring the slaughter when it comes to scaring up their customers – keeping them on their toes….and bringing them back in again. With several major haunts in and around the Chicagoland area, the #1 slot is hard to take – but these young brilliant evils know how to strike that winning balance. Something they’re very proud of – and customers have come to expect from their spectacular haunt. With events year round, the crew at Massacre sets out to prove that Halloween is not just a one time a year experience for those who love it - but a year round creepy adventure. With events during both Christmas and Valentine’s day – the crew at Massacre give fans a good, heart warming horror fix - with some mid season fun. With very unique, dark nightmarish ideas, the crew at Massacre really know how to pull their customers into some of their most horrendous nightmares - leaving them not only scarcely breathing but scrambling for an escape route out! Masters at a good scare – even terrorizing the most seasoned! – The creatures here at Massacre set their scares up nicely with some highly detailed, realistic scenes and some good old fashioned fun. A must do haunt when in the Chicago area. The Massacre is gritty,…dirty, great fun and very original. There is nothing else like it. The Massacre’s brand of darkened horror is a great example of an over the top horrifying haunt – one residents look forward to year long. We had the opportunity to speak with Derek Seltzer – manager of The Massacre Haunted House – and official creepy mascot Pedo the Clown about what makes The Massacre so special. Derek. Could you please explain about the creepiness, and how your haunt is unique. How the actors get into your face, invade your comfort zone and simply have fun with their patrons.. The Massacre started back in 2001 as a temporary setup, that we had to take down every year. We knew that this was the main thing holding us back. 2014 changed that and we went on to a permanent building and we basically re created what our vision of the Massacre should be. We wanted to bring something the area has never seen before. The amount of small detail we put into our scenes, mixed with the right sound, lighting and our amazing actors, takes our customers INTO their nightmares. This location was perfect for us, with 20,000 sq feet we made our sets bigger more crazy than we did before. We have about 50 actors a night. The house is designed to work with less, but it pulls away from the experience. The actors show up at 4:30pm and they check in, get their costume, then get their makeup done. At 6:45 we have a meeting to get everyone up to date on the haunt, (what we are expecting) it’s also a good way to get them pumped up. Our make up staff is 6 makeup artists that work all the way up till we open making others scary looking, then they hop into their own characters and scare as well. At the end of the night we have another meeting, talking about what happened during the night, who go actor of the night, what problems we have, and how well the haunt went. I like keeping my staff all informed and to keep them motivated to do a great job. It works! October we were ranked #1 by Haunted Illinois, Chicago Tribune, and 6 out of 5 Chainsaws from the Horror Tourers. I love haunting and so does everyone on our staff, so we decided to stretch out the haunt season into the winter. We decided back before we opened in October that we will be opening up for Christmas and Valentine’s Day. We have seen this done before at other haunts but it wasn’t a huge success. So we decided that we were going to take a crack at it and keep scaring people outside of October. Let our actors do what they love to do so much, SCARE. Christmas took us a while to figure out, how to make a Christmas Massacre, but it was worth it. Our customers were in awe when they entered the haunt. I still can’t believe how amazing it looked. Christmas gone horribly wrong. Evil elves, Christmas Clowns, and all of Santa’s little helpers all terrorizing a Christmas wonderland. Valentines day weekend was a black out event. The customers had only a glow stick and pitch black haunted house full of creatures. The customers were getting so lost and so scared. Will we keep doing off season events? Its way too much fun, You better believe it. For 2015 The Massacre will be having a huge renovation. The sets are bigger, taller, higher detailed, more effects, WE ARE GOING CRAZY WITH THIS YEAR. To find out what keep an eye on our Facebook. If you saw our show in 2014, 2015 will blow you away. Don’t think we are not changing our 3D haunt. Our 3D haunt will be getting a detail overall, the best one we’ve done. Also we now have “Massacre Tactical Laser Tag. We originally built part of our haunt to be converted into a laser tag arena during the off season. This is the most detailed laser tag arena i’ve seen. With the most realistic guns and the high detailed sets, it truly feels like a real life video game. That is now open till October. With this type of grotesque and unique experience, visitors to The Massacre need to question not only their sanity, but should they have the necessary skills to survive the evil that lives within .….Do you?! About the Author: Jeanie Kent is an avid lover of terror, horror and all things Halloween. She has worked with HauntedIllinois.com reviewing seasonal attractions, giving a realistic view on what visitors like to see in a haunt. Creating her own yard haunt each year, Jean has always had a love for all things horror..earning her the name Halloween Jeanie by her friends. Jean owns VFN Fiberglass along with her husband and mother in law, making 1/4” mile body components for customers around the world, featured on the new series Street Outlaws, Drag Race High and countless magazines. In her spare time, she loves to travel, garden and is on a constant mission to break out of the mundane. Searching out the strange, unique, cheesy, and mindless entertainment all in the name of having fun.